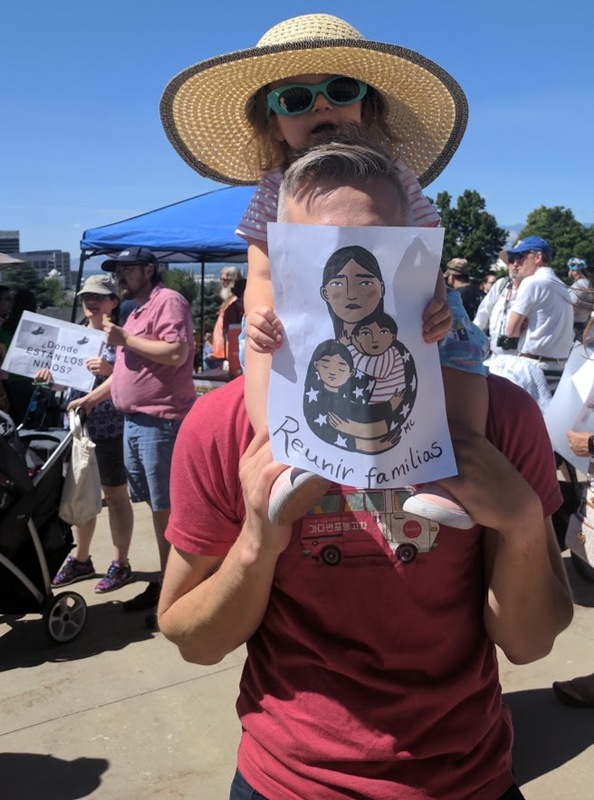 On June 30th, widespread protests to the new family separation policy were held. We were traveling to our daughter’s at the time but made sure we planned our day around a rally and stopped to participate with the local people in their state’s capitol. #FamiliesBelongTogether trended across social media platforms as people gathered in peaceful protest. Appropriately, people marched with their children, many pushing strollers, or carrying them on their backs up the steep hill before we gathered on the capitol steps in protest to the atrocities, and in solidarity with the people our government had so brutishly attacked. The commercial media did not give these large protests the coverage they deserved; and, in fact, at ours went out of their way to find the one person who supported the heinous act to focus the cameras on and interview when thousands around him were gathering in peaceful protest. I can’t say enough about the way the people at the demonstration conducted themselves; strangers, coming together for another, a perfect counterbalance to the culture of cruelty we were actively resisting. The public outcry did serve to reverse the inhumane policy (formally), although the children who had already been taken so savagely from their parents’ arms were left in the various detention centers–there was no thought when they had been separated as to how they would be reunited. As the weeks went by, the horror continued. Parents were lied to and signed papers they couldn’t read thinking they were signing to get their children back when, in reality, they were giving up their right to any claims of asylum, and they were deported without their children who remained in the “detention centers.” And, once again, mass media did not do its job as the plight of these families fell off the 24/7 news cycle and they were very quickly rarely talked about by commercial media. If you have ever participated in a public non-violent demonstration, please tell about that time. If you have never been to a peaceful demonstration, please tell why you have not chosen to do so. If roles were reversed, and your children were forcibly taken from you, what would you want strangers to do for you?